Mum made quiches with lots of different ingredients, but I think this crustless one with Chorizo sausages was was a bit of a departure from her usual style. I think she would have found it quite a change from the bacon or ham she usually used. 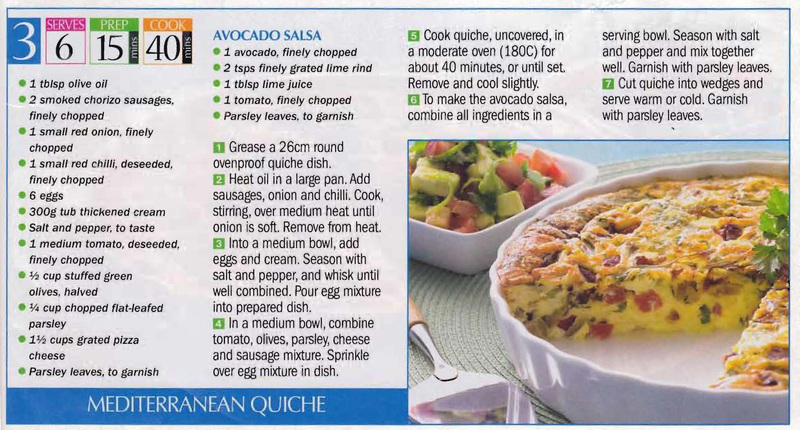 This entry was posted in All Recipes, Savoury Quiches/Pies/Patties and tagged 2000s, chorizo sausages, cream, crustless quiche, eggs, mediterranean quiche, olives, parsley, pizza cheese, red chilli, red onion, tomato by bebsrecipes. Bookmark the permalink.